Now, our favorite noise reduction headphones are even more amazing with the extremely stylish LIMITED EDITION White EX-29 headphones. We have studied and reviewed literally hundreds of headphones including top brands like Bose, Sony, and Koss. We believe the Direct Sound EX-29 headphones are the best headphones on the market for blocking sound and delivering professional, crystal clear audio. Dynamic Closed Type Headphones with advanced an-isotropic magnet drivers for superior Fidelity and Sensitivity.The headphones have a 9 foot cord with a 3.5mm stereo plug. A 1/4 inch gold plated adapter is included. Only available from QuietHeadphones.com, you can select a 9ft cord or a 40 inch cord for your headphones. If you mainly use your headphones with an iPod/MP3 player you might find the 9ft cord to be a bit long and cumbersome. The 40 inch cord (slightly longer than 3 feet) is less likely to snag or get tangled when moving around. We are the only Direct Sound Dealer who can offer the 40 inch cord option. Both the 9ft cord and the 40 inch cord are made from the same premium, heavy duty material and only differ in length. 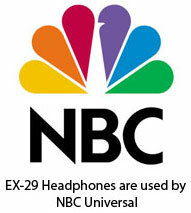 The EX-29 headphones work by keeping the background noises out and your music in the ear cups. By keeping the unwanted sounds out, you can listen to your music at a much lower volume which keeps you from damaging your ear drums. Keeping the music in your ear cups allows you to listen to music in quiet places without bothering people around you. It also prevents sound from bleeding into live microphones when recording. To get a sense of the sound isolation, start listening to music through your headphones. Then take off your headphones and push the two ear cups together. Even with the headphones just a few inches away you can’t hear anything! Some noise cancellation headphones attempt to block sound by sampling the outside sound and then producing an equal, but opposite sound inside your headphones to actively cancel out the unwanted noise. This form of noise cancellation is called active cancellation and has gotten a great deal of attention due to the complicated technology used. Active noise cancellation is an effective way to block sound, but it tends to produce a hissing, swooshing sound inside the ear cups. Also, this technology requires batteries. If the batteries die, not only does the noise cancellation stop working but on many models the music stops too. Providing an astonishing 29 decibels of isolation from outside sound, the EX-29 headphones have specially designed ear cups that passively attenuate surrounding sound marking a breakthrough in high-fidelity, studio quality headphones. Unlike active noise cancellation headphones, the EX-29 headphones don’t use batteries. Since the EX-29 headphones don’t try to produce any extra sounds to cancel out background noise you won’t hear any hissing or other noise artifacts. You just get crystal clear, accurate sound. Keep the outside noise on the outside and the music on the inside. 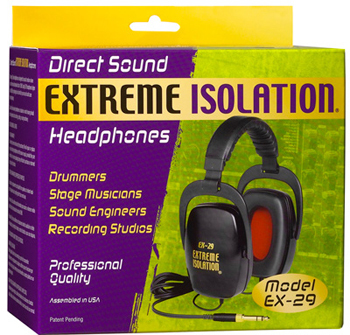 With 18 years of experience building isolation headphones we have come up with the best headphones on the market. Here are just a few of the features and benefits of using the EX29 headphones. Won’t leak sound into live microphones while recording. Allows studio musicians to hear only the studio mix during recording – eliminating costly return trips to the control room. Stage and studio drummers can hear how drums are being mixed without having headphones at high volume. Listen to music in a quiet setting without disturbing people next to you. Listen to music while your neighbors mow their lawn. Increase concentration by blocking out distracting noises. Lightweight comfort can be worn for hours without fatigue. This is 29dB of Noise Reduction! 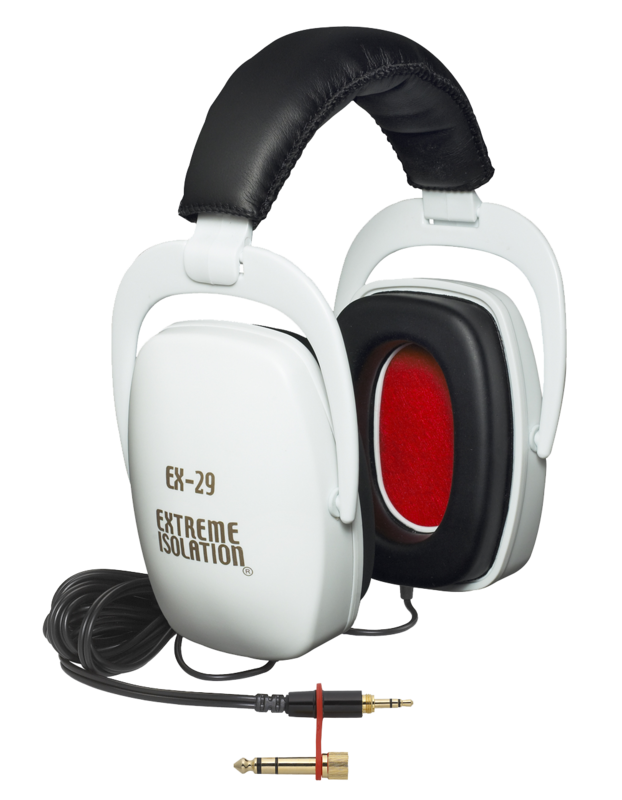 We have developed the following audio clips to demonstrate the extreme noise reduction provided by the EX29 Extreme Isolation headphones. When you listen to the first audio clip, the volume starts out at 0dB, as if you were listening normally to the drums. After about 10 seconds, the sound drops down to 10dB of noise reduction demonstrating the amount of noise blocked by a normal pair of high end studio headphones. At 18 seconds, the volume bottoms out at 29dB of noise reduction. This is Extreme Isolation. With the EX29 noise cancelling – canceling reduction headphones you will only hear what you want to hear! This second audio clip is a demonstration of what your music will sound like when using the EX-29 headphones. The clip starts out with just the background noise then Colbie Caillat’s Bubbly starts playing showing you what normal headphones would sound like. 8 seconds into the clip, the background noise is reduced by 29db representing listening to the song through EX-29 Extreme Isolation Headphones. Then we stopped Colbie at 19 seconds to show you what the background noise sounds like when you are not playing any music through the headphones. You will notice that you can still faintly here the background noise when no music is playing. Simply putting on the headphones drastically reduces background noise. If you are not listening to any audio through the headphones, you will still be able to hear some background noise. As this audio clip demonstrated, playing some music through the headphones masks out virtually all background noise.